My notes from the annual NASSCOM Technology conference , 2016. 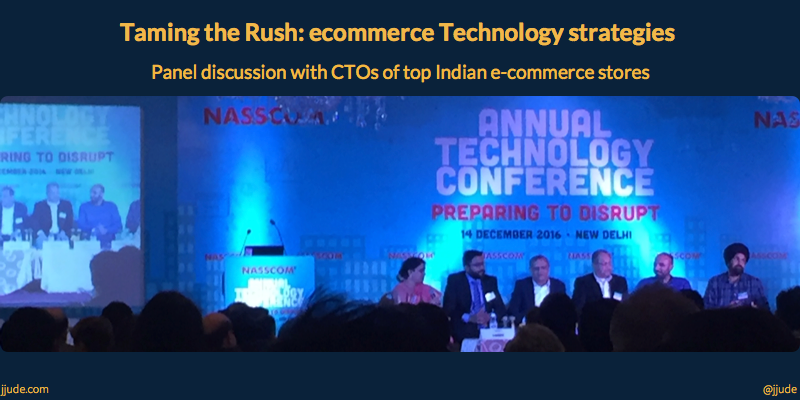 I attended the annual NASSCOM Technology conference on 14th December in Delhi. This is the 3rd NASSCOM conference I’m attending. This was by far the best NASSCOM conference. Except one or two, all speakers were “doers”. They shared their experiential knowledge. There were no professional keynote speakers or consultants who, at best, have 2nd-hand knowledge. When the day ended, I was glad I was there. A Nandini, VP Delivery of GlobalLogic, moderated the session extremely well. She sought out what happens at the background in handling heavy sales periods like Diwali (equivalent to Black-Friday sales in the West). In case your partners are the primary drivers (like Airlines for Make My Trip), you need to have monitoring systems that can alert quickly. Every year business changes. Just because you were able to handle spike one year doesn’t mean you will handle the traffic next year too. You need to constantly watch your system and optimize continuously. Another excellent session was presented by Cynthia Srinivas & Soumendra Daas of Intuit. They talked about their experience in migrating their monolithic application to cloud. I got so immersed, I didn’t take much notes. Today’s startups are born cloud-native. What about enterprises who have large business applications in-house? You should have sweep mechanism to scan the infrastructure to identify unused infra and redeploy them. There was a session by Viral Shah, co-creator of Julia language. Obviously, he tried to convince, Julia is the best language for data science. He mentioned an interesting point. We, in software industry, have two language problem. You could write program fast or you could execute program fast. He mentioned that Julia solved this problem. Note to self: learn Julia in the coming months. Last of the interesting session was Challenges and Strategies for Mega Nation Building projects. Of course everyone was all praises for demonetization and all were in awe of the progress India is making and all (without a faintest sympathy to people dying while standing in queue and others losing their daily wages standing in queue). But there was an insightful section of the session. When we think of scale, we immediately think of Facebook, Google, and Twitter. But we forget IRCTC, Aadhar, and election. They are bigger than most of the systems that come to mind when we think of scale. We always discount the giant among us. Even the best can improve. So there is one suggestion: they should arrange for a store room for attendees from outstation to keep their luggages safe. Otherwise, this was a well arranged conference. Will definitely attend the next one.